The 2.5 lb. 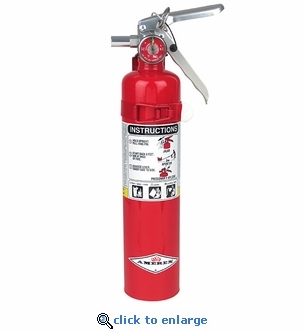 Amerex B417 multi-purpose fire extinguisher is UL Listed and USCG Approved for class A, B & C fires. These ABC Dry Chemical Fire Extinguishers are ideal for personal vehicles, work trucks, boats, home and work shops. Quickly extinguishes small fires on contact. Vehicle Bracket: Model #817 Included. Wall Bracket: Model #4834 Included. Range (Initial): 9 - 15 ft.